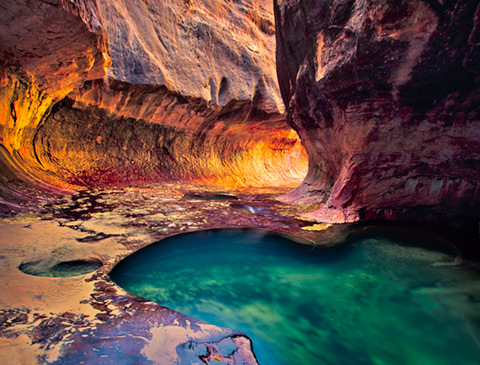 Located just one hour from Saint George lies Utah’s first national park, Zion. “A place of peace and refuge” is what the name Zion actually means. As you marvel at the enormous sandstone cliffs that practically leap into a brilliant blue sky and breathe in the clean air, you’ll probably agree that the name fits. You can follow the same paths where pioneers and ancient native people walked. If you feel like a bit of a challenge, try a narrow slot canyon. You’ll find that Zion’s wide variety of plants and animals will draw you in as you soak up the unique history of the past and enjoy the thrill of today’s adventures. Zion National Park has plenty of activities for everybody from the high adventure outdoor enthusiast to the history buff, and everything in-between. While the majority of people do come to Zion National Park to get out, stretch their legs, and go for a good hike; it’s not uncommon for visitors to stay near the lodge, catch up on their reading, and relax. If you drive through the east side of Zion to U.S. Route 89 you’ll find that it allows you access to the north rim of the Grand Canyon in the south or to Bryce Canyon National Park in the north. 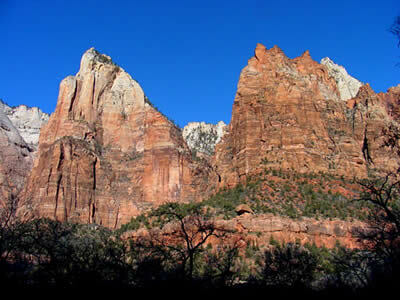 While both of those are wonderful parks, few places can compare with the peace and beauty that Zion has to offer. If you’re the type to sit and enjoy a nice picnic with the family, make note that The Grotto in Zion Canyon, the Visitor Center, and the viewpoint at the end of Kolob Canyons Road have the only designated picnic sites. Nature walks, and evening programs are a wonderful way to get a little closer to nature and learn something new in the process. Don’t feel like walking the trails yourself? No need to worry, guided horseback riding trips are available at Zion National Park. Enjoy the serene beauty without breaking a sweat. All of these are available from late March to early November. There is even a Junior Ranger Program for ages 6 to 12. The program is active from Memorial Day to Labor Day at the Zion Nature Center. If you would like a little bit of help planning your stay feel free to contact the Rangers at the Zion Canyon Visitor Center and the smaller Kolob Canyons Visitor Center. A bookstore attached to the Zion Canyon Visitor Center, run by the Zion Natural History Association, offers books, maps, and souvenirs for sale, with proceeds benefiting the park. In Zion Canyon you’ll find that there are trails for everybody. There are a whopping seven trails with round-trip times as low as thirty minutes (such as Weeping Rock) all the way up to four hours (such as Angels Landing). Two of the most popular trails, Taylor Creek (4 hours round trip) and Kolob Arch (8 hours round trip), are in the Kolob Canyons section of the park, which is closer to Cedar City. Looking for something a little more challenging? Try hiking up into The Narrows from the Temple of Sinawava. Because this hike involves going through water, it is typically most popular in summer, and hiking beyond Big Springs requires a permit. With all the short walls like Touchstone, Moonlight Buttress, Spaceshot, and Prodigal Son being very popular for rock climbing it’s easy to see why Zion National Park is a hotspot for rock climbers. In fact, it’s not uncommon to see some of them hanging from a cliff as you hike along the path. My four favorite hikes are Angel’s Landing, The Subway, Fat Man’s Misery, and The Narrows. Angel’s Landing takes you to the top of a huge rock peninsula in the middle of Zion’s National Park. There are a few sketchy places where there are chains to hold onto as you climb to the summit. Be careful, it is extremely dangerous if you were to lose your step. Once you reach the top, you can see for miles in every direction. It is an amazing view. In my opinion, it is better than the north rim view of the Grand Canyon. The Subway is so popular you will need a permit and need to plan far in advance. It is an all day hike and will require any thing from at least a short rope to a full wet suit, harness, and repelling gear depending on the season and your climbing skills. This hike descends from the pine tree mountaintops, where there may be snow, down into a slot canyon that has been cut out of the sandstone rocks to look similar to subway tunnel in a big city. The majority of the hike is in water so be prepared for everything to get wet. You also need to keep your eye on the weather because a flash flood could prove deadly. Fat Man’s Misery is a well-kept secret. My wife’s grandfather, Thomas P. McArthur, first pioneered this hike. It starts in the park just past the last tunnel, but the hike end outside the park. I don’t believe it is an official hike, but in our family it is. It is recommended that you have repelling gear, but it is possible to complete without if you are an excellent climber. It is similar to The Subway, but is missing the crowds of people and tunnel shape in the slot canyon. The pick up point is also very difficult to find which can leave you stranded for hours at the end. Make sure you go with someone who has been before. Due to several very narrow passages, the hike was given its name Fat Man’s Misery. Watch the video. The Narrows is also another one of my favorites. However, like The Subway it is very popular and requires a permit unless you are going to start at the bottom and fight the current and gravity. The hike is 16 miles long, and the canyon is up to 2,000-feet deep, and at times only 20 to 30-feet wide. You are hiking in the Virgin River, so you need to be prepared to swim, wade, and walk in the river. Again, be careful of flash floods and freezing water depending on the season. The only “in park lodging” available at Zion is at Zion Lodge, located halfway through Zion Canyon. Zion Lodge is open year-round and has motel units and cabins. There is also a restaurant, café, and gift shop at Zion Lodge. If you want to reserve a room here it is recommended that you plan well in advance as rooms do fill up fast. There are three campgrounds available in Zion National Park. If you want something more primitive, stick with Lava Point (open June-October) located in the middle of the park off Kolob Terrace Road. South and Watchman at the far southern side of the park are the other two and both are very pleasant. Watchman, however, is the only campground in the park that takes reservations. Overnight camping in the backcountry requires permits. If you aren’t able to secure lodging at Zion Lodge, don’t start to sweat. Right by Zion National Park on the south is the town of Springdale, Utah, which offers services such as lodging, food, and entertainment. 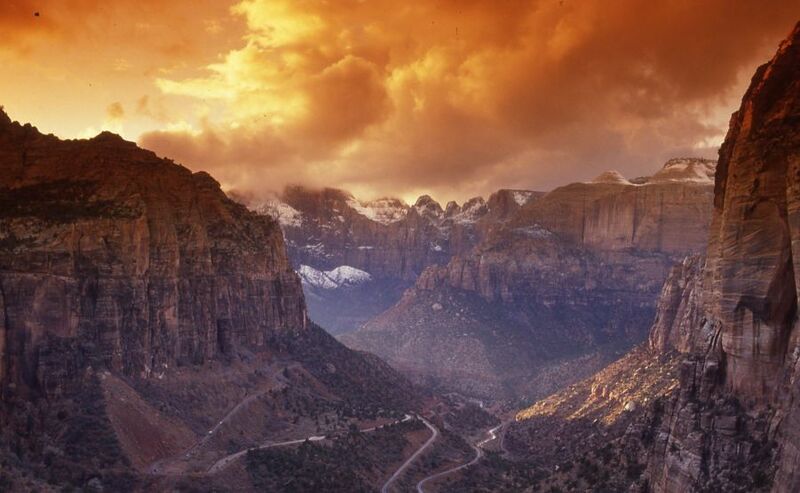 History enthusiast might choose to make a visit to Zion Canyon IMAX in Springdale, which offers many interesting documentaries about the natural history of Zion Canyon and the American Southwest.